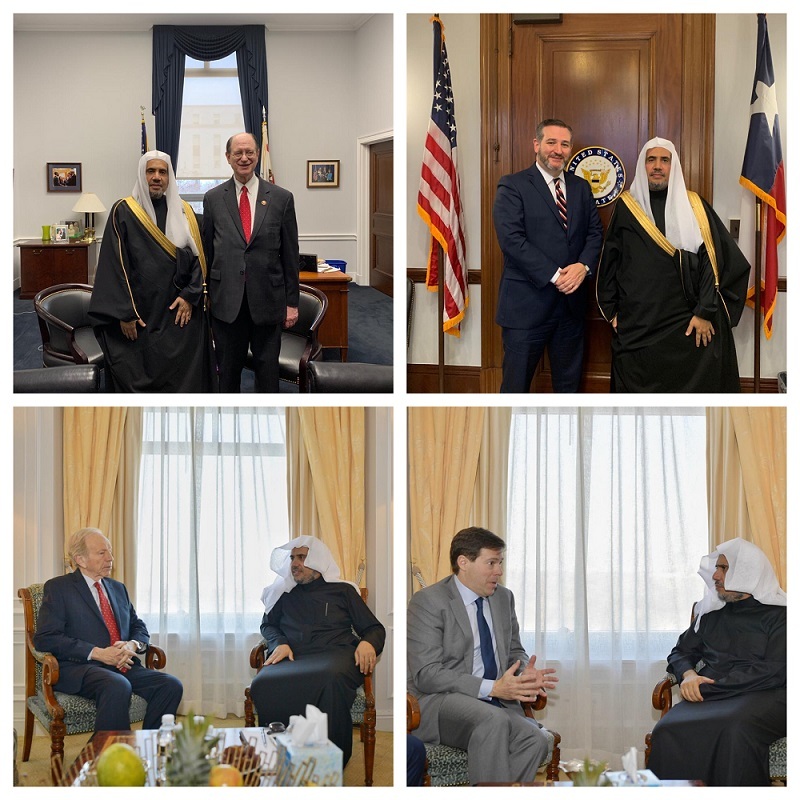 During his current visit to the United States of America, H.E the Secretary General of the Muslim World League, Sheikh Dr. Muhammad bin Abdulkarim Al-Issa met US Senator Ted Cruz in New York to discuss with him a number of topics of mutual concern. Senator Ted Cruz has valued the Muslim World League's international efforts to raise awareness of the values of moderation and deep confrontation of the concepts of violent extremism and terrorism. He praised the MWL's programs aimed at promoting coexistence and harmony in countries of religious and ethnic diversity. In another meeting, and at his residence in New York, H.E Dr. Muhammad Al-Issa received Senator Joseph Lieberman, former chairman of the Senate Committee on Homeland Security, and they discussed a number of issues related to the confrontation of the concepts of violent extremism and terrorism, means to promote the values of moderation and coexistence around the world and spread of tolerance and dialogue with all civilizations. Besides that, H.E Dr. Muhammad Al-Issa received Congressman of the Democratic Party of California, Brad Sherman, and discussed a number of topics of mutual concern. The Secretary General of the Muslim World League met also with the Executive Director of the Anti-Extremism Project, Ambassador Mark Wallace, and they discussed means of confronting radicalization, violence and deviant and extremist thoughts and reviewing areas of mutual action and cooperation.